Despite some of the fresh office design layouts seen in recent years—think open offices and virtual offices—many of us still have difficulty separating the image of the office cubicle from the idea of the modern workplace. Unfortunately, that image isn’t always a positive one. In fact, it often tends to be a symbol for the more negative qualities that can be associated with working in an office, such as confinement, isolation, and a lack of individuality. Since the 1960s, with the advent of the Action Office unit created by designer Herman Miller and inventor Robert Propst, the office cubicle has helped to revolutionize how we work on a day-to-day basis. Miller mainly took his cue from the earlier Burolandschaft (“office layout”) design scheme, which encouraged collaboration by grouping open work desks according to employee function. Unlike with Burolandschaft, Propst found that privacy was actually an important element to employee productivity and so should be integrated into the personal workstation. Action Office was then really the first office furniture system that recognized the full scope of an employee’s workplace needs, including not just the need for socialization but for privacy as well. If Action Office was designed to positively emphasize the individual in the workplace, then how do we have such a negative connotation of the modern office cubicle that has directly evolved from it? It could be said that for years office cubicles have been unfairly stereotyped by people in a way. Popular culture and the media haven’t always done much to change people’s negative opinions on them either. The 1999 cult classic Office Space is probably one of the most well-known films that focus on the drudgery of working in an office job. 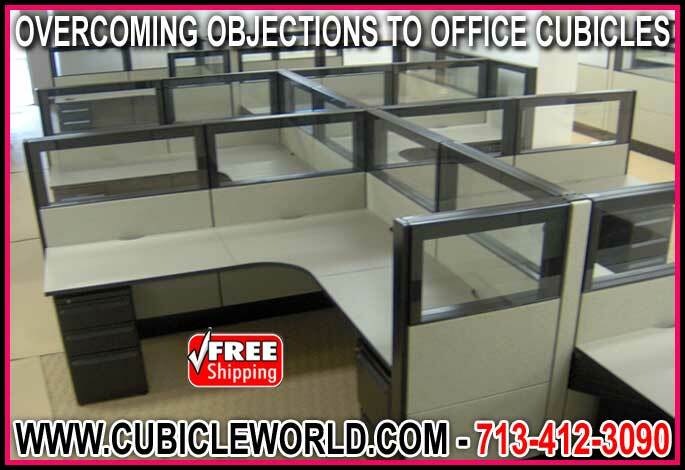 Of course, in most of the movie the office cubicle proves to be an inescapable backdrop as the protagonist and his co-workers face the detachment, monotony, and daily frustrations of their office environment. The Dilbert comic strip is another classic that’s done its fair share of criticizing its characters’ high-walled office cubicles, referring to them as soul-poisoning and spirit-crushing. The occasional panel may compare working in one to being kept in a cage or even prison, highlighting a common sentiment that office cubicles are too confining, as mentioned earlier. There’s some truth to this, but it may have more to do with past trends rather than modern reality. Through the 1980s, the cubicle did end up getting smaller and more tightly packed as the structural reorganization of corporations meant moving much staff out of their offices and into cubicles of their own. But it wasn’t long before there was pushback on the decreasing office cubicle space, and by 1994 the average cubicle floor area grew to 90 square feet. Today, with its highly responsive nature allowing for a variety of customizable elements—dimensions, materials, colors, lighting, etc.—it’s clear that the office cubicle is designed with worker comfort in mind and can be anything but confining. That being said, there are several ways that an office worker can maintain a healthy amount of personal privacy without feeling locked or alienated from the rest of the office. You can “open” your cubicle first by using medium-height (53 inches high) external panel walls. This can allow a stronger sense of connectivity to your coworkers and other surroundings. Also, incorporating see-through paneling can bring an airiness to your office cubicle while letting in beneficial natural and ambient lighting. Because lighter colors are more light-reflective than darker colors, keeping cubicle surfaces and panels a bright shade will give the illusion of more space. Another way to ensure that your cubicles feel less confining is through the proper office layout design. For instance, the decision for an open office plan or a closed one. While the open office was supposed to free office workers from the confines of their office cubicles, we’re now finding they can also be a hindrance to productivity, due to environmental distractions and the need for some privacy. Employing thoughtful office layout design would bring the benefits of both open and closed concepts by blending the two. In any case, a good office layout design will determine how to properly accommodate all existing and future employees within the available. When you optimize the use of office space, you can cut down on wasted common space and potentially increase office cubicle size, leading to comfortable workers who enjoy their place of business.